Forty-four states levy a corporate income tax. Rates range from 4 percent in North Carolina to 12 percent in Iowa. Four states, Minnesota, Alaska, Connecticut, and New Jersey, and the District of Columbia levy corporate income tax rates of 9 percent or higher. Six states, North Carolina, North Dakota, Colorado, Mississippi, South Carolina, and Utah, have top rates at or below 5 percent. Nevada, Ohio, Texas, and Washington impose gross receipts taxes instead of corporate income taxes. Gross receipts taxes are thought to be more economically harmful than corporate income taxes. South Dakota and Wyoming are the only states that do not levy a corporate income nor gross receipts tax. Corporate income taxes are levied in 44 states. Though often thought of as a major tax type, corporate income taxes account for just 5.3 percent of state tax collections and 3.9 percent of state general revenue. Top statutory corporate tax rates range from a low of 4 percent in North Carolina to a high of 12 percent in Iowa. 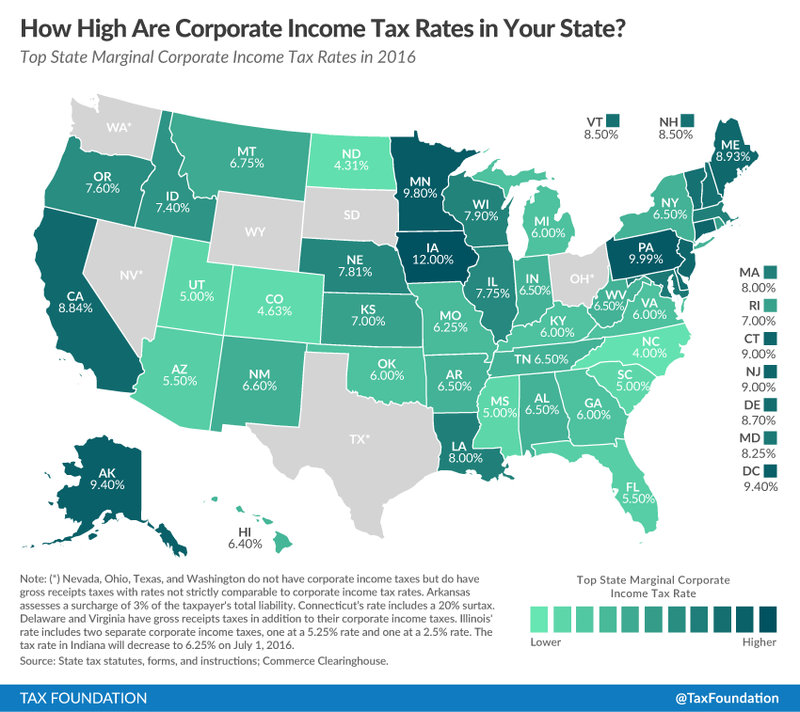 Iowa’s highest top corporate tax rate is followed by Pennsylvania’s, at 9.99 percent. Four states and the District of Columbia levy corporate taxes of 9 percent or more: Minnesota (9.84 percent), Alaska (9.4 percent), the District of Columbia (9.4 percent), Connecticut (9 percent), and New Jersey (9 percent). At the other end of the spectrum, six states have top rates at or below 5 percent: North Carolina at 4 percent, North Dakota at 4.31 percent, Colorado at 4.63 percent, and Mississippi, South Carolina, and Utah at 5 percent. Nevada, Ohio, Texas, and Washington forego corporate income taxes but instead impose gross receipts taxes on businesses, which are generally thought to be more economically harmful. Delaware and Virginia impose gross receipts taxes in addition to a corporate income tax. South Dakota and Wyoming levy neither corporate income nor gross receipts taxes. North Carolina cut its corporate income tax from 5 percent to 4 percent as a component of the multi-year phase in of its comprehensive 2013 tax reform package. The state now has the lowest rate of any state levying a corporate income tax. Indiana’s rate was cut by a half percentage point for the fourth straight year since 2011, from 7 percent to 6.5 percent. 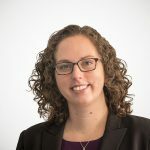 Nevada instituted a problematic “Commerce Tax,” a gross receipts tax that combines elements of the Texas Margin Tax and the Washington Business and Occupation Tax. Arizona’s rate decreased from 6 percent to 5.5 percent. The rate fell in New Mexico from 6.9 percent to 6.6 percent. New York’s tax decreased from 7.1 percent to 6.5 percent. “State & Local Government Finance, Fiscal Year 2013.” U.S. Census Bureau. http://www.census.gov/govs/local/. See Mikesell, John, “Gross Receipts Taxes in State Government Finances: A Review of Their History and Performance,” Tax Foundation, January 2007, https://taxfoundation.org/article/texas-margin-tax-failed-experiment; “Broad-Based Gross Receipts Taxes: A Worthwhile Alternative?” Institute on Taxation and Economic Policy, http://www.itep.org/pdf/pb40grt.pdf. Kwall, Jeffrey L. “The Repeal of Graduated Corporate Tax Rates.” Tax Notes (June 27, 2011): 1395. June 27, 2011. Malm, Liz. “North Carolina House, Senate, and Governor Announce Tax Agreement.” Tax Foundation. July 15, 2013. https://taxfoundation.org/blog/north-carolina-house-senate-and-governor-announce-tax-agreement. Drenkard, Scott. “Indiana’s 2014 Tax Package Continues State’s Pattern of Year-Over-Year Improvements.” Tax Foundation. April 7, 2014. https://taxfoundation.org/article/indiana-s-2014-tax-package-continues-state-s-pattern-year-over-year-improvements. Walczak, Jared. “Nevada Approves New Tax on Business Gross Receipts.” Tax Foundation. June 8, 2015. https://taxfoundation.org/article/nevada-approves-new-tax-business-gross-receipts. Duda, Jeremy. “Income Tax Cuts Emerge as Key Issues in AZ GOP Gubernatorial Race.” Arizona Capital Times. June 3, 2014. http://www.arizonatax.org/news-article/income-tax-cuts-emerge-key-issue-az-gop-gubernatorial-race. Malm, Liz. “New Mexico’s Lawmakers Compromise to Pass Corporate Tax Cut Reduction Package.” Tax Foundation. March 20, 2013. https://taxfoundation.org/blog/new-mexicos-lawmakers-compromise-pass-corporate-tax-cut-reduction-package. Henchman, Joseph. “New York Corporate Tax Overhaul Broadens Bases, Lowers Rates, and Reduces Complexity.” Tax Foundation. April 14, 2014. https://taxfoundation.org/article/new-york-corporate-tax-overhaul-broadens-bases-lowers-rates-and-reduces-complexity.